Italy has the only active volcanoes in mainland Europe. This is because the country is located close to the boundary of the African Plate and Eurasian Plate. The volcanoes are divided into three areas; the Campanian volcanic arc runs northwest through the center of Italy. 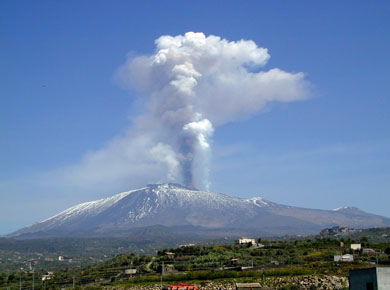 The second group of volcanoes is clustered northeast of Sicily, and then the third is in the Mediterranean Sea, around the island of Pantelleria. 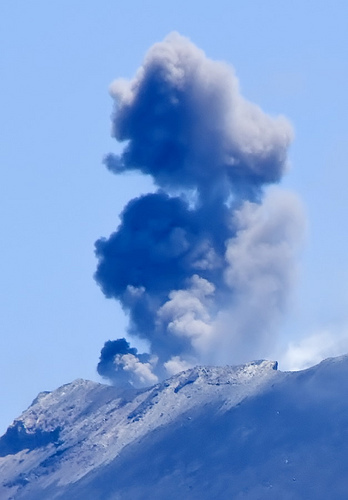 Though it contains many volcanoes, there are only three that have erupted in the past century. Mount Etna, the biggest volcano of Italy (and therefore of Europe). It is located on the east coast of Sicily, and is about 3,329 meters (10,922 feet) tall, though this changes according to eruptions. It is one of the most active volcanoes on earth, having continuous activity. Because of the eruptions, it has caused the surrounding soil to be rich in minerals, therefore suitable for agriculture and vineyards. The second active volcano is on Stromboli, which takes up a small island in the Tyrrhenian Sea, north of Sicily. It is one of the nine Aeolian islands, and is 926 meters (3,034 feet) tall. A few hundred people live on this island. Stromboli also has continuous activity, constantly erupting through the three active craters on the peak. Its last major eruption occurred in 2009. Stromboli has been continuously active for the past 20,000 years. Mount Vesuvius is located east of Naples, Italy, in the Bay of Naples. 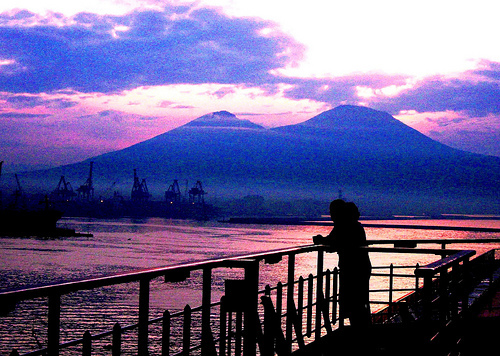 It is the one active volcano on mainland Italy, as well as mainland Europe. It is not currently erupting, which is fortunate, as it has had some historically very damaging eruptions that have wiped out towns and killed thousands. This mountain is prominent in ancient history and mythology, as the ancient Greeks and Romans thought of it as sacred to the hero, Hercules. Today, the area around Mount Vesuvius is the most densely populated volcanic region on earth. Apart from the active volcanoes in the modern age, there are a number of dormant volcanoes around Italy and its many islands. Vulcano, one of the Aelion Islands, had last erupted in the late 19th century. Another one is Ischia, which is an island west of Naples, has last erupted in 1302.